The waterfall, Ringedalsfossen (also called Skjeggedalsfossen) with a free fall of 300 m, are today regulated and can only be seen when there is overflow in the reservoirs above. But this happens several times a year. I have seen lot of pictures of the Ringedalsfossen, so with a little bit of luck you are one of the few to see one of the most beautiful waterfalls of Norway. I rated the fall 4 out of 5 stars! The Ringedalsfossen is a waterfall in the river Nybuåni which is fed by numerous small and bigger lakes on altitudes to 1.500 meters. 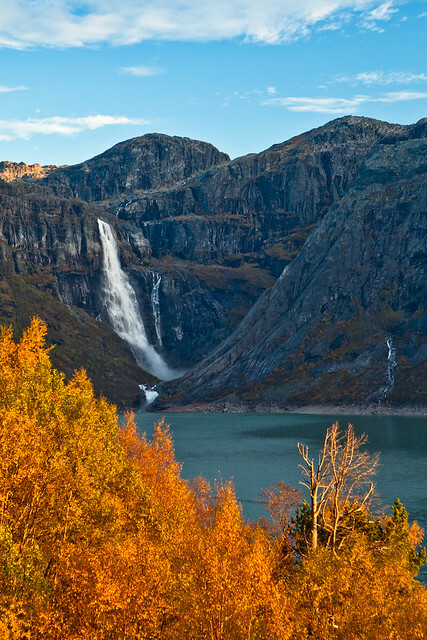 The Ringedalsfossen is situated at the end of the Ringedalsvatnet near the small village of Tyssedal, municipality Odda/Horaland. 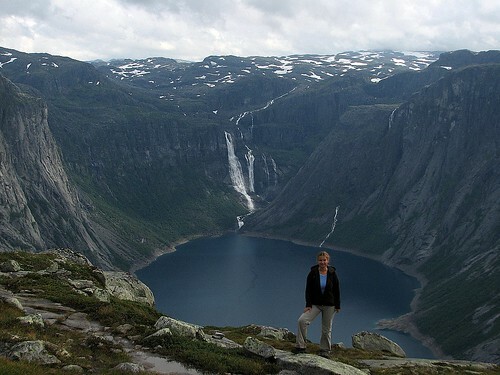 From Odda it is a 6km drive to the north, over road 13 before you reach Tyssedal. From Tyssedal there is a trail to the Ringedalsdammen from where you have to follow the north shore of the Ringedalsvatnet. At the end you should have a good view in the fall in the distance. It is a 2,5-3 hour hike to the end of the trail. I have also seen pictures from a height looking down to the lake and the fall. Nearby is a legend, the Tyssestrengene, one of the highest free fall waterfall in the world. There is only one big but….it is regulated and there aren’t any recent photo’s of the fall.